As an attorney, I have had a steady stream of young people to mentor throughout my career. When I was a law student, college students who wanted to go to law school wanted my advice for taking the LSAT and completing applications. As a young attorney, law students desperately needed counsel on landing a job. And as a senior attorney, the young ones need guidance on career choices and paths. So as I contemplate changing my career, I find myself in an interesting position. Who do I go to for advice, and how do I make that introduction? A plus of being a little more, ahem, mature, than most fledgling writers, is that I have a pretty awesome web of contacts. I may not know anyone in a field I want to learn about, but my connections on LinkedIn and my connections in real life (thanks, honey!) sure do. Today I had coffee with an editor of a popular regional magazine here in Denver. She was incredible: so generous with her time and advice, so honest with her opinions, so amazingly willing to continue this conversation whenever and wherever I need it. It took everything I had not to drop to her feet and ask to kiss her ring, but you’ll be happy to know I somehow resisted. It got me thinking, the best thing women entrepreneurs (and really career women in general) have to offer to their field is the time you give to the next wave of women coming up behind you. This morning I was nothing more than a 22 year old college student begging for a nugget of wisdom and a word of encouragement from someone who has been through it all before. So I’m challenging you – all of you amazing and successful SpitfireMoms – to take a few precious moments of your time to kindle the career-fire of a woman who is a few steps behind you in this journey. 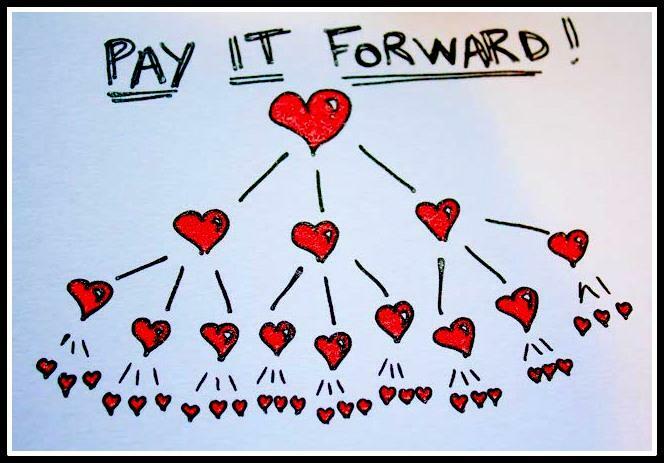 Pay it forward in your field, be it design, writing, blogging, whatever. Start participating in a local circle of awesomeness (The Founding Moms and Forth Chicago are fantastic examples) and find a fledgling career lady who needs what only YOU can give her. That woman will remember what you did for her, and when the next woman comes to her for advice, hopefully she will remember your small kindness and pay it forward again. Imagine a whole community of SpitfireMoms lighting up the creative world! She's an attorney by training, but a creative at heart. She is inspired by so much it overwhelms her at times: motherhood, traveling, wine, cooking, theater, home design, music, sports (yes, sports!) and books. She is beyond excited to be contributing to the Spitfire Mom Society. Jenn lives in suburban Denver with her husband and two boys.